Valet parking—A second lane was added recently to the Emory University Hospital (EUH) valet parking area to reduce wait times for car drop-off and patient pickup. 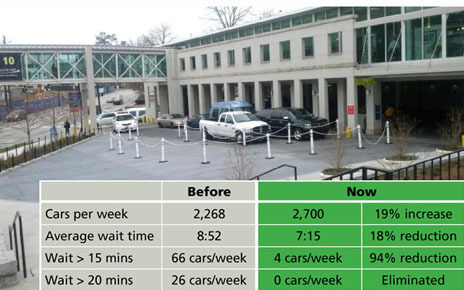 Prior to the expansion, the valet area accommodated 2,268 cars per week, with an average wait time of almost 9 minutes. The expanded area now accommodates 2,700 cars per week, with an average wait time of slightly more than 7 minutes. Wait times of more than 20 minutes were eliminated, and wait times of more than 15 minutes were reduced by 94%. Emergency department—EUH's emergency department (ED) moves into newly designed space this spring after the first of three phases of ED renovation is completed in late April. Once the ED has vacated its old space, that space will be gutted and rebuilt in phase 2 of the renovation, which is expected to be complete in late summer. Phase 3 will be complete when the ED occupies both its former and new space, all redesigned for greater ease of use, with input from patient and family advisers. The new design supports implementation of process improvements to reduce patient wait times and overall ED length of stay. ED space will double, and its configuration will allow for more efficient patient and staff flow. Treatment rooms will increase from 19 to 36 and are being standardized and enlarged for more clinician and family space. New bed tower—Construction crews continue to clear land and remove dirt on the site of the hospital's new bed tower across Clifton Road. The nine-story building will include 210 inpatient beds, a combination of new and existing beds that EUH will relocate from the current hospital building. The new building also will include operating rooms and various ancillary services. The new tower will rest on an underground, four-level parking deck, which will provide 400 to 600 spaces. Some 20,000 truckloads of dirt and 65,000 tons of rock will be removed during the excavation for the parking deck, to a depth of 50 to 55 feet. The J wing is expected to be completed in 2016, with opening of the new building scheduled for the first quarter of 2017. Two new service centers in research administration, one in the Rollins School of Public Health and one combining cancer and imaging in Winship and School of Medicine, began operation this month. The centers are being implemented as pilot projects to test business processes designed over the past 18 months to make research administration at Emory more efficient and effective and better able to serve faculty. The initiative is similar to efforts under way at other research universities, including Yale, University of Michigan, and UC-Berkeley, among others. Staff who administer sponsored research grants for faculty perform a variety of tasks that help keep research both on track in terms of funding and in compliance with complex regulations. Such work entails, for example, setting up research awards in a database, managing and reviewing award expenditures, processing invoices, assisting with budget development, and preparing financial status reports for sponsors, to name a few. 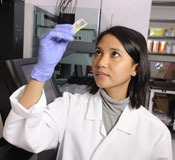 Performance of these tasks behind the scenes enables funds to keep flowing from sponsors, ensures that bills are paid promptly, and allows researchers to stay focused on their research. The more such tasks can be streamlined and standardized across the system, the easier it will be for all research administrative staff to provide consistent service to faculty as well as avoid duplication of work. "This is something we have to do to remain competitive in the research arena," says David Wynes, Emory's VP for research administration, who will oversee the pilots until an associate VP is hired later this year to oversee all such service centers. "Because our faculty have been so successful in garnering grants, our research enterprise has grown enormously over the past decade, and the administrative infrastructure to support grants needs to evolve to best support that growth. This is an opportunity now to make it work better and more efficiently." Over the next six months, the two centers will test some 30 new standard operating procedures as well as newly revised roles and responsibilities of staff members. Once these first two pilots have been tested, another 10 to 12 service centers across the university will be rolled out over the next 12 to 18 months, starting this fall. "The pilots will be working out the kinks and figuring out what works and what doesn't," says Wynes. "They will incorporate some functions that previously have been handled centrally within the university and will operate as local units, accountable to the departments, schools, and faculty they serve but with central oversight to assure consistency and quality in their performance across the institution." Two of those on the front lines of discovering what works and what doesn't in the new service centers are Lori Snead and Bill Lambert, who lead the pilots in the schools of medicine and public health, respectively. Snead's pilot center combines research administrative services for cancer and imaging, specifically Winship Cancer Institute and medical school departments of hematology-medical oncology, radiology and imaging sciences, and radiation oncology. One of the goals of the service centers, she says, is to provide a balanced workload for staff as well as adequate backup resources so that customer service remains unaffected by individual staff vacation or family leave. "We have plenty of cross coverage," she says. "Melding our processes will take time, but the team is already starting to gel and is ready to take ownership." For his part, Lambert says his team in public health is excited to be at the forefront of testing to help blaze a trail for the future in research administration. "Rollins has been working collaboratively in the past, but the pilot will allow us to take that to a new level by adopting new tasks and responsibilities that better serve faculty." 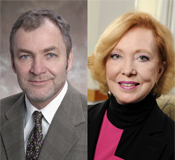 The effort to help ensure the success of the pilots going forward is cross collaborative, involving not only those in central finance and administration but also people and offices throughout health sciences, including executive associate deans Dean Surbey in public health and Barbara Schroeder and Heather Hamby in the medical school. For more information about the service centers, please consult this website, using your Emory login and password. Emory's two genomics core facilities recently united under one roof. The new Emory Integrated Genomics Core (EIGC), located on the seventh floor of the Woodruff Memorial Research Building, is a consolidation of genomics labs in the Winship Cancer Institute and School of Medicine. The goal of this effort is to create a top-tier genomics resource that is widely available to the Emory research community. The EIGC's new scientific director is Michael Zwick (human genetics). 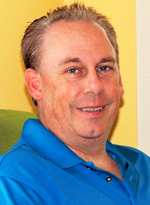 Zwick will oversee the operations, strategic planning, and expansion of the core's services. "Talking about genomics is easy, but effectively using genomic technologies is more challenging," Zwick says. "Our mission is to make genomics easier to use for the non-expert." The new facility will combine basic genomic services and advanced "next-generation" sequencing technology with "downstream" bioinformatics analysis. Zwick says that nucleic acid sequencing has become a basic commodity of biomedical research, "like water or electricity." A division pertaining to CLIA (Clinical Laboratory Improvement Amendments—federal regulations governing lab tests on humans) will enable processing of patient samples for clinical trials. Services include nucleic acid extractions and biobanking, along with access to next-generation sequencing. 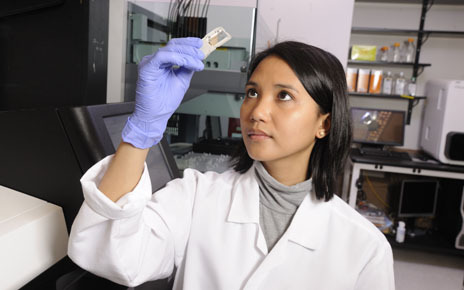 A research division will provide various types of genotyping services in-house. Some large-scale sequencing research tasks will be outsourced to specialized sites, says Zwick. "In some cases, we can take advantage of economies of scale and use outsourcing to reduce costs. This means increased capacity, lower costs, and a faster turnaround time for customers." A computation division will provide data storage and computing services and will be compatible with other computational biology applications such as proteomics and biostatistics. The core is jointly supported by the School of Medicine and Winship Cancer Institute. Read more. Note: In addition to the EIGC, there is a new nonhuman primate genomics core at Yerkes. 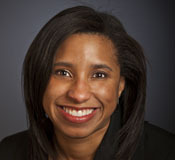 When Jasmine Hoffman arrived to lead communications at the Nell Hodgson Woodruff School of Nursing in 2010, she got a unique opportunity only weeks into her new job. The BP oil spill devastated the Gulf coast—and, thanks to Hoffman's savvy in media relations, made a media star of Dean Linda McCauley, an expert on the health consequences of environmental exposures. McCauley appeared in virtually every major media outlet, including a segment on the Weather Channel, talking about the potential long-term physical and psychological damage to residents and workers charged with cleaning up the mess. In the week that followed the spill, the school's media hits jumped more than 200% and sustained that level for an entire year. Later, Hoffman and her Emory communications colleagues won the top media award from nursing's Sigma Theta Tau International Honor Society. To know how Hoffman goes about telling the school's stories is to see how dramatically communications has changed in the past decade. She still uses traditional tools. 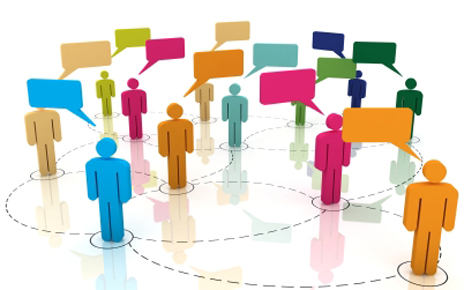 But more and more, communication involves the school's interactive social media channels. One of the biggest referring mechanisms to the school's website, for example, is its Facebook page. Prospective students are likely to go first to Facebook to get a sense of what's happening in the school and to ask questions. Prospective and current students and increasing numbers of alumni also get updates via Twitter. Since 2011, the school's Flickr account—a network for sharing event and other photos—received more than 32,000 hits. A student-written blog, Emory Nursing Now, providing glimpses into the life of students, also has a big following. Hoffman has her own following and is frequently asked to share her expertise. The American Association of Colleges of Nursing asked her to speak to conference attendees about how social media has contributed to the school's success in attracting both quantity and quality of applicants. 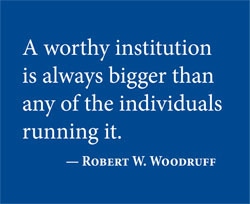 (In 2012, the school had the largest number of applicants in its history.) The Association of Healthcare Philanthropy was interested in how she uses social media in working with colleagues in development and alumni relations. (One point she reiterates is that traditional communication is more typically 9 to 5, whereas social media never sleeps.) This month, she will speak to the Association of Fundraising Professionals about using social media to boost fundraising for small non-profits and planned giving organizations. 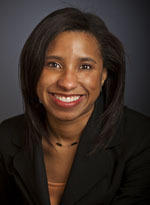 A native of Alabama, Hoffman completed an MBA while working as PR manager at the University of Pittsburgh. When she interviewed at Emory, she says, Pittsburgh was still freezing, while the trees here were starting to bloom. But what really sold her was the opportunity to use communications to "help drive Dean McCauley's vision for the school and to work with the nursing faculty." 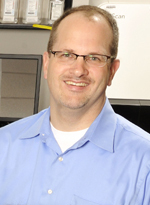 Hoffman's work was recognized this year with the university's Award of Distinction. A few weeks ago, 139 Emory medical students took part in a tradition with important implications not only for the students themselves, but also for the future of health and medicine in this country. The Match Day ceremony annually matches students with their preferred residency programs through the National Residency Match Program. Amid much fanfare and excitement, the students opened envelopes to reveal where their careers as doctors would begin. Forty-five of the students will spend all or part of their residencies in Georgia, and 42 will remain in Emory's affiliated residency training programs. Others will receive their training at peer institutions such as Georgetown, Brigham & Women's, Johns Hopkins, Baylor, UC-San Francisco, and Duke. Each year's Match Day ceremony is a celebration of our world-class students and their accomplishments. Our students consistently fare well in the Match; they are nationally recognized as highly competitive candidates and frequently are selected to participate in the residency program of their choice. Their success reflects the excellence of the students themselves, of course. After all, only 2.7% of the more than 5,000 students who applied to our School of Medicine in 2012 were enrolled. But their success also reflects the excellence of our medical curriculum, the talent and dedication of our faculty and staff, and the outstanding learning opportunities made possible by our first-rate health system and our many local partnerships. As our students begin the graduate medical education (GME) experience, they do so at a time of unique challenge and opportunity. Our health care system faces increasing demands, and our physician population is aging. (The Association of American Medical Colleges estimates that one in three physicians practicing today will retire in the next 10 years.) These and other factors will only exacerbate the current physician shortage. The GME system itself also is at risk. Federal funding cuts are curtailing the number of resident positions available to graduating medical students, and unless more residency slots are created, the record numbers of students receiving medical training in the U.S. will have little impact on the practicing workforce. As our own graduating class of extraordinary young doctors begins the GME experience, I'm confident in their ability to tackle the challenges and make the most of the opportunities that lie ahead. Congratulations and best of luck to them all. Please direct questions and comments to evphafeedback@emory.edu. Winship executive director Walter Curran will serve as one of three chairs who will guide NRG Oncology, a new cancer cooperative that integrates three of 10 cancer groups currently supported by the National Cancer Institute. Curran will continue to serve as chair of the Radiation Therapy Oncology Group, one of the three groups merging into NRG Oncology. The other two groups are National Surgical Adjuvant Breast & Bowel Project and the Gynecologic Oncology Group. 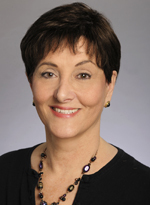 Winship’s associate director for outcomes research, Deborah Bruner (nursing), also joins NRG Oncology as deputy group chair for scientific publications. The reorganization was prompted by an Institute of Medicine analysis of NCI-supported clinical research, conducted on behalf of the NCI. Read more. Start-up of 2012: Clearside Biomedical (Henry Edelhauser, ophthalmology). Last month, Clearside received $7.9 million in venture capital. Read more. Patients who have babies at Emory University Hospital Midtown (EUHM) now have the choice to publicly bank the baby's umbilical cord blood, at no cost. Cord blood, which is normally discarded following delivery, can be used to replace bone marrow for patients with certain blood diseases, including leukemia. If a baby's cord blood unit meets all criteria for possible transplantation, the unit will be frozen and stored at the Cleveland Cord Blood Center in Ohio and listed with the National Marrow Donor Program registry. Cord blood units that cannot be used in transplant may still be acceptable for research. Read more. At this year's second annual What's Up, Doc?, people from Atlanta and beyond enjoyed dinner and lively discussion with Emory experts in heart disease, brain chemistry, stroke, vision care, and more. Educational sessions on Alzheimer's disease and sleep disorders began the evening. Afterward 97 guests mingled with 38 experts and 16 students from the Woodruff Health Sciences Center in the lobby of the Atlanta History Center before sitting down to dinner. "The event really is an amazing way for people in the community to hear about the exciting research and the cutting-edge care going on in our schools of medicine, nursing, and public health and at Winship, Yerkes, and Emory Healthcare," says medical school dean Chris Larsen, who hosted the event. "Just as important, it's a way for doctors and researchers to hear what issues are on people's minds regarding their health." This year's most popular topics were "The Best Defense: Alzheimer's Disease," "Depression Bites," and "Good Night: Putting Sleep Disorder to Rest." Julie Ginden Sears sat at "The Whole Person Approach" table. " It exceeded my expectations," she said. "Very well done! The experts were extremely open, insightful, patient, and engaging. I thoroughly enjoyed the interaction and conversation at the table." Hemophilia of Georgia recently announced that it had donated $2 million to fund an endowed chair in hemophilia and hemostasis in Sidney Stein's honor. Stein joined Emory's medical faculty in 1975, and his research focuses on hemostasis and thrombosis. The Health Sciences Communications (HSC) office has moved to 1762 Clifton Road, Plaza 1000. The group vacated its previous space on the first floor of the Woodruff Health Sciences Center Administration Building (WHSCAB) to make way for a new group of research grant administrators. HSC's new offices are interspersed with those of colleagues in University Communications and Marketing. HSC includes media relations, research communications, web design, creative services, and social media. Health sciences photographer Jack Kearse, videographer Damon Meharg, and media relations officers Janet Christenbury and Kathi Baker remain in WHSCAB. Ira Horowitz (chair, obstetrics and gynecology, and chief medical officer, Emory University Hospital) has been appointed to the Emory Healthcare Board of Directors. The following faculty and staff members in health sciences recently received awards: View details. April 10: Public Health Grand Rounds: Walter Willett of Harvard University presents the Uncertain Path to Sufficient Certainty, 12 p.m. in the Rollins Auditorium, CNR bldg. 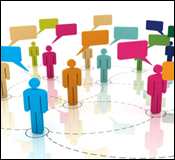 April 16: Office of Technology Transfer seminar on designing product protection, 1 p.m. More info. To register, contact Ashley Myers, 404-727-1785. April 17-19: TEDMED Simulcast in WHSCAB auditorium. Schedule and speaker list. April 25: Kauffman FastTrac TechVenture course on helping technology or science-based entrepreneurs grow an idea into a business. More info.